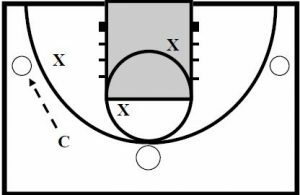 This rebounding drill is from University of Arkansas women’s coach Mike Neighbors. We start the drill with three offensive players outside the 3 point arc. before the ball bounces on the floor. Initially we don’t allow offense to crash. When we go live and allow offense to crash, one of the offensive player at the top of the key is not allowed to rebound and the free X player has LOGO area responsibility. This helps simulate teams with a player back in transition Can build up to 4 or 5 by adding a post player on the block to work on wedging out!!! Starting the players in their GAP positions is more game-like than having them hugged up on defense. Our HIT terminology refers to us making a solid, aggressive HIT on every offensive rebounder. In five years of using this technique we have been called for exactly ZERO fouls for being overly aggressive. GIT is really GET, but since my players make fun of my accent its become GIT and has stuck. GIT the ball is something that I don’t feel most coaches drill enough. Going for the ball can be instinctual but it can also be learned and if you emphasize/ reward it you’ll have a great rebounding team. Make it competitive by assigning points for each time the ball hits the floor on a rebound to each team. When going live go plus and minus for offensive and defensive rebounds. I would like to be added to his newsletter please.